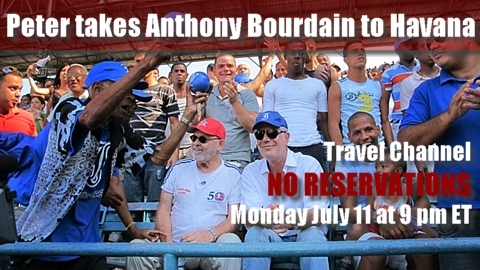 NO RESERVATIONS CUBA with Anthony Bourdain debuted on the Travel Channel Monday, July 11 and will enjoy repeat airings throughout the summer (check on-line schedules at the Travel Channel website). The episode opens and closes with a “taste” of Cuban baseball as Tony and I first visit a youth game in Havana (10-year-old division city championship), then take in the Parque Central baseball debating society, and finally visit a league game between Industriales and Ciego de Avila in venerable Latin American Stadium. The episode was filmed during March 2011. Below are links to a number of on-line video clips (promos) of the show, as well as the outtake segment of an interview with legendary shortstop and current Industriales manager Germán Mesa that didn’t make the final production cut. Believe me, this show is the next best thing to being in Havana itself.